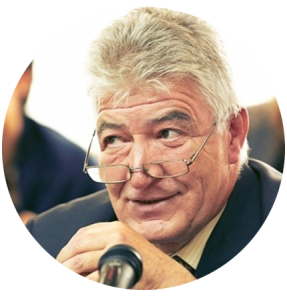 Sándor Köles has been one of the key figures of the civil movements, as well as a board member of United Way Hungary. As he says, he was born to serve the community. He’s a true cosmopolitan, with a strong belief in local bonds, identities and the power of hearts. He has been an active leader and participant of Hungarian civil innovation from as early as the 1970’s. Where does your civil spirit, your perpetual wish to do something, come from? I think it runs in my blood somehow. I was raised in a family where taking care of others and solidarity were fundamental values. Somewhere deep inside, I’ve always been led by the service of community and it determined my career choices as well. You started your career in the ’70s as a cultural manager and used your professional opportunities to foster the development of civil society. Long before the end of the communist regime, it took a great deal of courage. Yes, I was the long-time director of the former influential community place ’Belvárosi Ifjúsági Ház’ (~Downtown Community Centre for Youth), where we took in lots of novelty organisations. More than that, we even gave the opportunity to quite a few artists working on the edge of illegality – e.g. Péter Esterházy, György Petri, György Dallos, Mihály Korniss – to make their debut. The underground bands of the era made appearances here as well, for example Bizottság or URH took their wings here, and László Dés gave jazz concerts too. Fortunately, artistic freedom is an everyday phenomenon nowadays and civil organisations are free to assemble as well, but during the communist era, the mere existence of a centre with such a liberal atmosphere was considered brave indeed. It’s always been your passion project to support bottom-up, innovative initiatives. In the ’80s you founded a so called „provocator-training centre” with your peers, which these days could be compared to the incubation of social ventures. My team and I had taken up project plans that aimed to solve social problems, even if at first they seemed to be crazy. We invited applications from forward-thinking people living in villages and looked for ideas that were welcomed nowhere else. As a proof of the demand for self-organization, we have received around 500 applications for our first tender, out of which we chose 14 to support and further develop along with their idea owners. We offered trainings, counselling, brainstorming and our network to help the ideas come true. This is what we called the provocator-training centre. A lot of initiatives with good social causes took roots here back then and they lasted in the long term too, some of them are holding up to this day. In the last 25 years you have led a number of foundations and so a great many civil initiatives, now with lives of their own, are attached to your name, both in Hungary and across the borders as well. Can you mention one success story still dear to your heart which serves as an example that even seemingly impossible situations can be turned around? Luckily I have more than one success stories, one of them dating back to the time of the provocator-training centre. One of the project plans chosen to be supported was of a gipsy woman, Marika Nagy Sándorné, who worked as a dishwasher in an institution for special education in Edelény. Seeing that so many intelligent children get caught up in bad behaviour, she dreamed of founding a special school for local Roma children, where their ambition, faith and confidence could be fostered by person centered education and methods of art pedagogy. We stood up for her. Marika worked unbelievably determined and hard for this school. She herself got her high school degree, and started college all the while leading the school so successfully, that even parents of non-Roma children enrolled their kids there in growing numbers. The school stood to be a role model, so much so, that in the pedagogical community the “school of Edelény” became a common term. Marika was truly a visionary leader and without her strong internal motivation, probably she and lots of talented Roma kids from her school would have gotten caught in bad behaviour too. Later her talent raised her into the senior lecturer chair at Teacher’s Training College of Nyíregyháza. As someone with so much experience, what advice do you have for the enthusiastic youth who decide to have a career in the civil sector? My motto is that we have to get familiar with what we have, if we’d like to change it. So my advice for them is to be good listeners before anything else and spend as much time in the field as possible. Get familiar with the communities they would like to stand for. Get to know the people, culture, semantics and symbolism of a community. This is a lengthy learning curve requiring reciprocity and humility, but it cannot be spared in my opinion, because without it, one can’t be sure if they’re making positive and permanent changes in society. The other substantial part is a good team, more specifically, for the team to have their heart in the right place. When you’re building a team in the civil sector, you have to pay extra attention to find out where people’s hearts lie. Mind is important of course, the knowledge a person brings to the team, but in my view, when it comes to the civil society, the heart is more important in the end. Finally I would encourage them to think long-term. Try to overcome problems, see them from a holistic perspective and push for solutions which are carrying the promise of institutionalization. It means that an idea has the potential to be part of a system, to become mainstreamed and therefore sustainable. You’ve always been open to the world and travelled around. Is there something in your backpack from abroad you’d like to implement in Hungary? The opening of intellectual horizons is of great importance for me. One shall not be intellectually provincial. According to my value system it is vital to acquire a global point of view, to make an effort to be aware of global trends, to let myself get inspired and to be brave and bring home to Hungary what works in the world. I have learned so much from travelling and living abroad and I was fortunate enough to have been able to bring a lot of those things alive after I came home. However I have two very specific dreams, which I’ve cherished for a long while but the opportunity to realize them hasn’t come yet. Community foundation and community economic development are two existing models, with a lot of good examples in the US and in Western European countries, for which I’ve been looking for an opportunity to execute at home for a very long time now. Can you word it to yourself, what drives you, what motivates you, what is the one thing that helps you overcome even the biggest professional obstacles? The engine is the feeling of responsibility towards society, and the love of others, their friendship and the success of a given community are the things that help me defeat any hardships.